Whilst carrying out a Full Building Survey on a property in the Croydon area, we came across this very interesting project in Purley. Planning permission has been obtained to add another floor of flats to the existing structure. 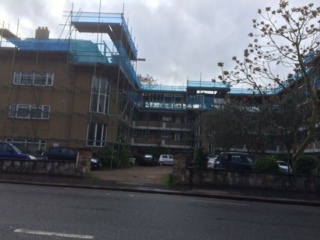 The additional storey is being built on top of the existing flat roof. This type of development is becoming more common where Local Authorities are comfortable about the additional height of the building. Often slate or tile hung timber mansard roofs are built in these circumstances which has the double benefit of both creating additional flats / development and also improve the architectural appearance of the building.